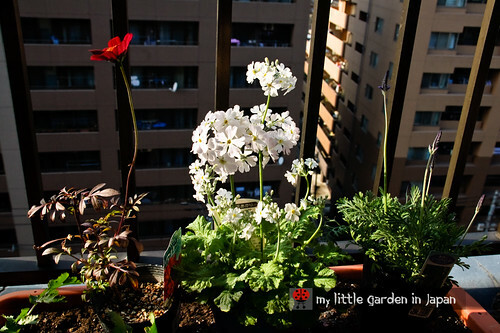 my little garden in japan: New flowers for Blooming day! This past weekend I went to a trip to the garden center to get some fresh air after having being locked in the house from my cough. Because I already ran out of space on the balcony, I was planning to be careful and resist the temptation to buy anything. But they already started having a lot of the spring flowers and of course I couldn't resist myself. A couple of flowers came home with me, just in time for blooming day! Since I had to harvest all the komatsuna because of the aphid problem, one of my hanging planters got free. I was going to put a couple of the veggies seedlings in there but I decided that, since it is one of the upper planters, I should make it a flower box to match the others on that level. Egyptian lavender (Lavandula multifida) In here this kind of lavender is known as winter lavender. It is a favorite of little garden pots in Tokyo. I have seen it blooming all around this past months. I chose one that still has not open because I want to take advantage of the nice scent to attract a lot of butterflies in the coming spring. Fairy Primrose (Primula malacoides) I really like this one. It has a elegance that I can’t quite describe. The flowers feel a bit like the wings of a butterfly, and have a dusty color very similar to it as well. I think I will get another one, but in a different color, purple perhaps. Chocolate Cosmos This one was a great surprise. Last time I got flowers from my garden, I chose mint lemon marigold instead of this one because mint marigold is native from Mexico. So, now that I was forming a new planter, I decided to finally get it. The funny thing is that after checking around I found out that Chocolate cosmos is also native from Mexico. Small world for sure. Although, I should not be so surprised since most cosmos are native from Mexico and central America. Also, a sad note, chocolate cosmos is extinct as a wildflower, only the cultivated kind remains. This time I got two perennials for one planter instead of only one as I had being doing for the others. Hopefully they will grow well. And if they give any problems my guess is that I can always transplant to a different pot. The rest of the planter will be filled with some spring flowers. I still need to buy them, but I have a couple planed. I was thinking a couple pansies, but I already have those on the others. So I might pick something new to make a change. Hi fer, you have some pretty blooms for GBBD. A fave of mine is that chocolate cosmo.happy GBBD! 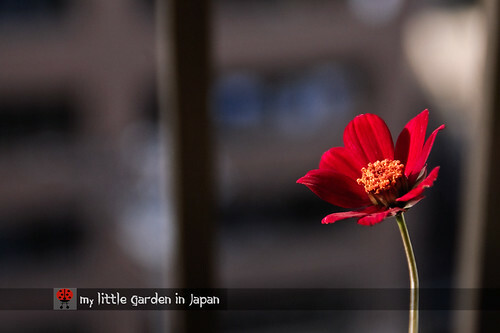 Fer, you must have the biggest little garden in Japan. You should do a video for us sometime, so we can appreicate how you pack all that wonder in a small space. Hi Fer, Your plants look happy in their new location. They are obviously not afraid of heights! Great choices for your balcony. Chocolate cosmos sounds as if you might be tempted to sample it, doesn't it? Happy Bloom Day. Your Chocolate Cosmos is very pretty. It is delightfully surprising indeed when you learn that the plant you have in your garden is native to your country of origin. It somehow brings you closer to home. Very pretty. I really like Primula malacoides and wish people would use them more around here. Apparently they were quite popular as winter-flowering house plants prior to modern heating which made the rooms to warm for such plants. Love your new plant picks, Fer. I've tried to grow Cosmos here but it doesn't survive our winters. Guess I should plunge pots and then lift them and overwinter them in my greenhouse. Like me,when at the nurseries its hard to resist not taking home some pots of flowers! I love cosmos in any colour, yours is something I havent seen so far. The one with white blooms is fairy primrose? Lovely! Very nice additions to your garden fer and just in time! 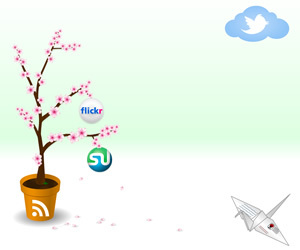 Happy Blooms Day! what a sweet collection, i love the chocolate cosmos also, its a nice contrast to the others. Chocolate cosmos is amazing! Thanks for sharing the picture, I grew it last year but I only got one bloom and it wasn't very good. Nice shots of the chocolate cosmos blossom - its going to be quite spectacular once it really gets going. Chocolate cosmos? I didn't know. It looks red. Happy Bloom Day! That's pretty edition to your garden! I love lavender! 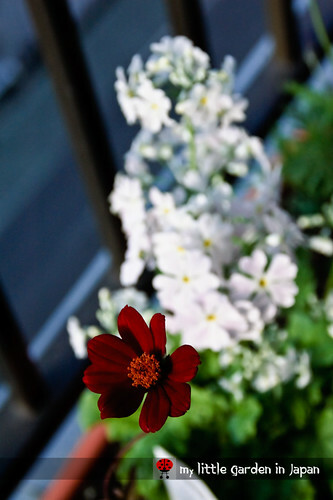 I like that Chocolate Cosmos, nice deep color. Great to see all your blooms! Happy GBBD! I specially like the chocolate cosmos. Your new box looks lovely, but I was so sad to hear that the Chocolate Cosmos now only exists in cultivation. A drift of that in the wild would be such a wonderful sight - and smell. Pansies or violas sound good as a spring annual - most of the other suggestions I would have are either perennials or bulbs or wallflowers which would provide a lovely perfume but unless you could find some mini ones would probably be too large and untidy for a trough! I'm just the same, I can't pass a garden centre without buying something. I love cosmos, such easy flowers to grow and they seem to go on blooming for such a long time too. I love chocolate cosmos too. I think I need to plant more cosmos this year. The chocolate cosmos look very pretty. Bees will love them. I am thinking of planting cosmos this autumn as I have seen them blooming in our neighborhood. Chocolate Cosmos... sounds as yummy as it looks! Thank you very much! I hope they will grow nicely in their new home. I still have to go and decide what else should I get. Being japan they had a lot of different chocolate flowers and they all smell different and have different color. I will try to get a photo of them later. Thanks for the introduction to Egyptian Lavendar...your balcony will be a lovely attraction to the butterflies! Oh do save the seeds from the chocolate cosmos!! That is a really lovely combination of plants. I'm struck by how much stronger and brighter your sunlight is than ours just now. It makes everything seem so much more cheerful. Well chosen collection Fer! Chocolate Cosmos is fab indeed! I love the name and look of the chocolate cosmos! I love primroses! Actually, I love just about all flowers. Your plants look happy and healthy. :o) The chocolate cosmos sounds tasty! Oh, I so love the chocolate cosmos! You'll really enjoy it. Pansies sound good to me, it's easy to find a color that harmonizes with what you have. Ah, chocolate Cosmos, quite a while since we had this plant, and the flowers really do have a smell of chocolate. Am I right in thinking your picture is showing the colour much brighter than it actually is. What about some old fashioned Forget me nots (Myosotis) for your Spring show. Beautiful blooms and some great photos showing them. Those flowers look so gorgeous. It is heartening to see you do so much in a balcony. Thank you very much! They have a lot of tones and "flavors" with different scents for the chocolate cosmos here in japan. Mine is one of the most reddish ones and it shows more because of the sun on that photo. darla ~ This chocolate cosmos doesn't give seeds because is a mix. Wish I could get some thought. Oh yes, I love that wine colour! Your blooms are lovely! I love that first photo! Chocolate cosmos, yum. It's beautiful. I have Chocolate Daisy (Berlandiera lyrata) and it does have a real chocolate scent. I didn't know that Chocolate Cosmos had different fragrances ~ wouldn't it be wonderful to grow a whole selection of them?